Today Mitsui Chemicals starts the construction of the factory at Chemelot for the production of innovative plastic material (PP Compound). The construction of this factory contributes to the worldwide trend to further reduce gas emissions. There is a growing demand in the automotive industry for lightweight solutions based on polypropylene plastic materials. In this way the weight of cars is reduced and this has a positive effect on fuel consumption, the range of electric cars, and also on the reduction of CO2 emissions. The start of production from the new factory is planned for mid-2020 and results in a direct employment of around 100 jobs. The production consists of compounding polypropylene (mixing plastics with fillers at higher temperatures). In addition to the production location at the Industrial Park, Mitsui Chemicals decided to establish a research center at Brightlands Chemelot Campus. In this way, the company is able to further expand its European market and serve customers directly and tailor-made. Mitsui Chemicals also strengthens the Group's global network. The selection for the Chemelot site came after a carefully monitored procedure by Mitsui Chemicals. The decisive factor was the fact that the automotive industry on the industrial site and the campus are well represented with players such as SABIC, Arlanxeo, DSM, Sekisui, Brightlands Materials Center, Polyscope and VDL Nedcar in the environment. "We are convinced that our locations at Chemelot and the Brightlands Chemelot Campus will be extremely beneficial for delivering services and materials of the best quality to our global and European customers. We especially want to thank the Province of Limburg and Chemelot with the establishment of the innovation campus and the Chemical Hotspot in Geleen. "; Mr. Niki, General manager Compounds Administration Div, Mobility Sector Mitsui Chemicals Inc. 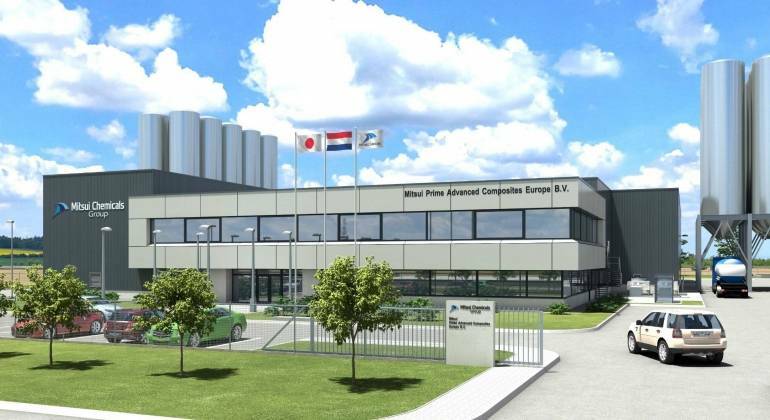 Provincial Economy and Knowledge Infrastructure, Joost van den Akker (VVD), is pleased that construction is now starting and Mitsui Chemicals has decided to also establish its research facilities at the Brightlands Chemelot Campus. That is also good for employment. "Mitsui Chemicals is a large internationally operating chemical company. In recent years, several Japanese companies have chosen branches in Limburg. We see that a Japanese community arises in our region that also attracts new investors from that country. The fact that Mitsui Chemicals, with a factory and a Research & Development department, chooses Chemelot is a confirmation that it is increasingly on the international map as a leading chemistry and materials site. This is partly due to the distinctive combination of the Chemelot Industrial Park and the Brightlands Chemelot Campus." Alderman Pieter Meekels (economy) of the municipality of Sittard-Geleen applauds that Mitsui Chemicals chooses Sittard-Geleen because the automotive sector is strongly represented in the region. "It is clear that the Brightlands Chemelot Campus and VDL Nedcar strengthen each other. Therefore companies choose this region is an important economic development for us. I am convinced that more companies choose this combination and strengthen the economy in the region." Robert Claasen, Director Chemelot is pleased that the construction starts. "I am convinced that we can help each other. Our way of working together at the Industrial Park and the Brightlands Chemelot Campus has proved its value. Mitsui Chemicals, like Chemelot, attaches great importance to sustainability and innovation and makes the explicit choice to further strengthen their European position within the automotive sector, both for the production and for the R & D part. We regard the fact that this is happening from Chemelot as a compliment to the way we work together at Chemelot with each other and with all authorities involved. " Bert Kip, CEO Brightlands Chemelot Campus explains "The materials ecosystem is one of the three pillars of the Brightlands Chemelot Campus. With Mitsui Chemicals, a world player in this field comes to the Campus and strengthens our rapidly growing cluster of materials. We are of course very pleased and are convinced that a win-win will occur: Mitsui Chemicals will benefit from the activities in this materials ecosystem due to the presence of other industrial players (from startups to large corporates), training in the materials field (think of CHILL and the Science and Engineering faculty of Maastricht University) and the public-private research institutes such as the Brightlands Materials Center and Aachen Maastricht Institute for Bio-based Materials). On the other hand, players in the ecosystem will benefit from the presence of Mitsui Chemicals. " ChemicaInvest officially transfers shares in Fibrant to the Highsun Holding Group Ltd.